Background: The Battle of Britain was in full swing, but the Nazis were annoyed that the British were bombing too. This illustrated essay from a weekly illustrated newspaper suggests that the British are intentionally bombing civilian targets. 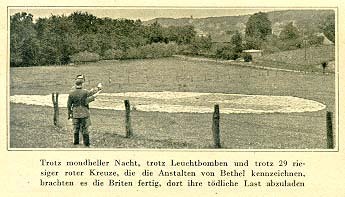 The source: “Der Vernichtungsbefehl Churchills,” Hamburger Illustrierte, Nr. 40 (28 September 1940), pp. 2-3. To distract the world from the German Luftwaffeâ€™s great successes in bombing London, Churchill ordered lies to be spread about great damage caused by the Royal Air Forceâ€™s raids on Germany. 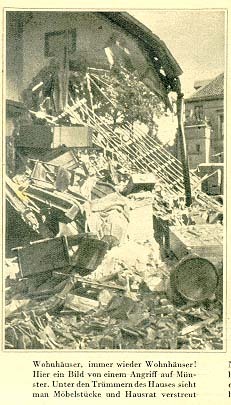 The German transportation system is supposedly in chaos, and numerous bombs have fallen on tracks and stations  or so the English say. But we know what they have really destroyed: houses, hospitals and cemeteries! 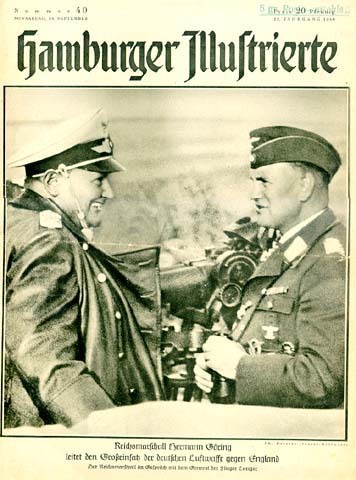 Reich Marshall Herman Göring directs the Luftwaffeâ€™s campaign against England. 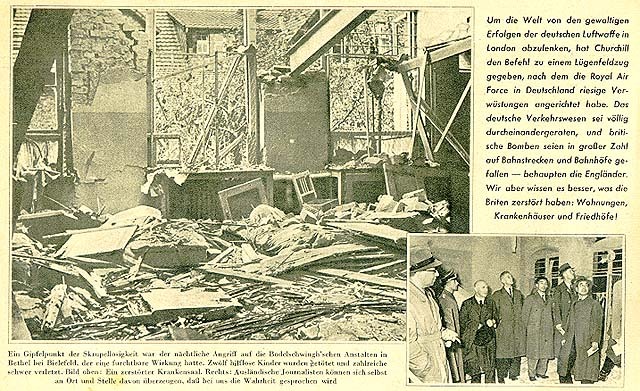 This apartment building fell victim to a night raid on Bremen. 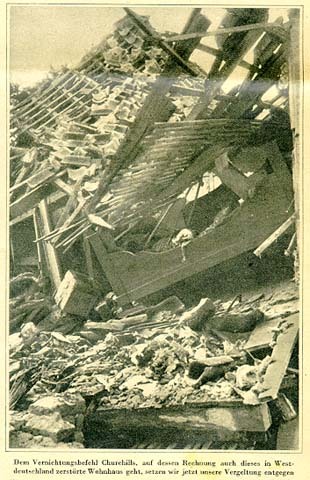 British bombs caused great destruction of housing and killed five civilians. This is the work of British flyers who, following Churchillâ€™s orders, do not shrink from murder. 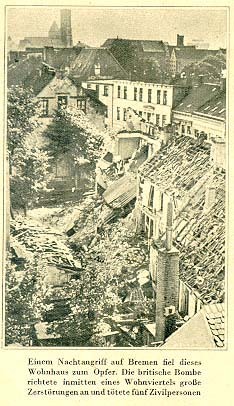 This house in Bremen was also destroyed. An attack in Heidelberg was a special “masterpiece.” In bright moonlight, dive bombers dropped seven bombs in a residential area. Four dead are Churchillâ€™s responsibility. More and more apartment buildings! This is a picture showing the results of an attack in Münster. One sees furniture and household goods in the wreckage. 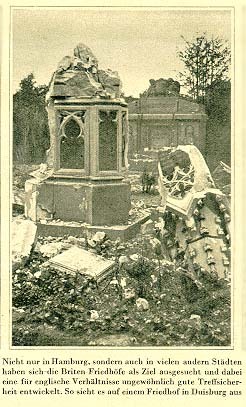 In Hamburg and many other cities, the British sought out cemeteries and showed (for them, at least) unusually good aim. This is a cemetery in Duisburg. Despite bright moonlight, flares, and 29 large red crosses, the British managed to unload their deadly cargo over the institute in Bethel. This western German house was also destroyed by Churchillâ€™s destructive orders. We are taking our revenge. Eight people were buried under the ruins of this building in Westphalia, which was destroyed by English bombs. 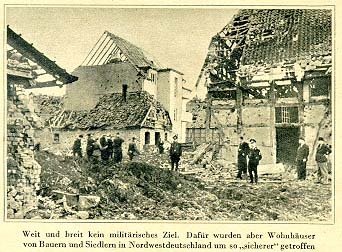 The height of unscrupulousness was shown in a night attack on the Bodelsching Home in Bethel by Bielefeld. The terrible consequences: twelve helpless children were killed and numerous others seriously injured. 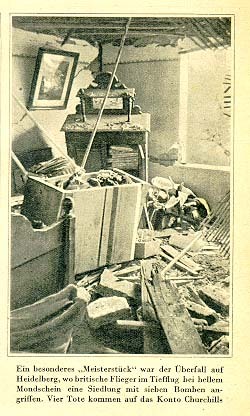 The picture above showed a destroyed hospital room. The picture to the right shows foreign journalists who can see for themselves that we are speaking the truth.